Carnival Street, originally uploaded by ~sierra sugar~. Old Europe Village is a quaint old-world place with little town shops lining the cobblestone streets. 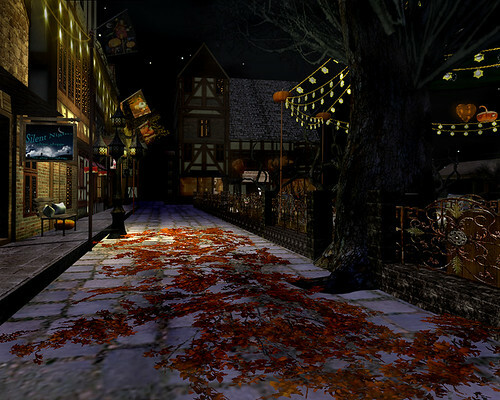 At its center is a town square hosting the annual Hallow's Eve Carnival. There are lots of hidden treasures to explore from dancing in the fog-covered graveyard, to riding the skull ferris wheel, a haunted tunnel of love ride, and even a haunted house guarded by zombies. Old Europe Village changes with the seasons, so be sure to catch the carnival while it's still in town. So its Halloween time and I've had a quote from my favorite movie in my head for some time. It's what inspired this post. Ray Bradbury wrote the book "Something Wicked This Way Comes" and Disney turned it into a movie in 1983. While many know the quote, few are familiar with its interesting history. With peace on Earth, good will toward men"
and autumn branches creak with fright. when something wicked this way comes. when something wicked this way comes."